I am nowhen close to being on time with this week’s photo challenge from WordPress, which is simply a quasi-clever way of segueing into the fact that the theme this (last?) week from those folks who host this blog (and many many others) is indeed “close“. My offering is a collection of dings and dents in the asphalt that are close to each other. This section of damaged road is on the same street that closes every Sunday so that pedestrians and cyclists can enjoy a leisurely stroll without having to worry about dodging cars and trucks. All of these ruts and cuts appeared within a week, so how did this happen? A few weeks ago, the district of La Molina opened up a health clinic on this section of the road to help treat people for all manner of minor medical issues, mental health matters, and there is even an adult playground full of exercise equipment. 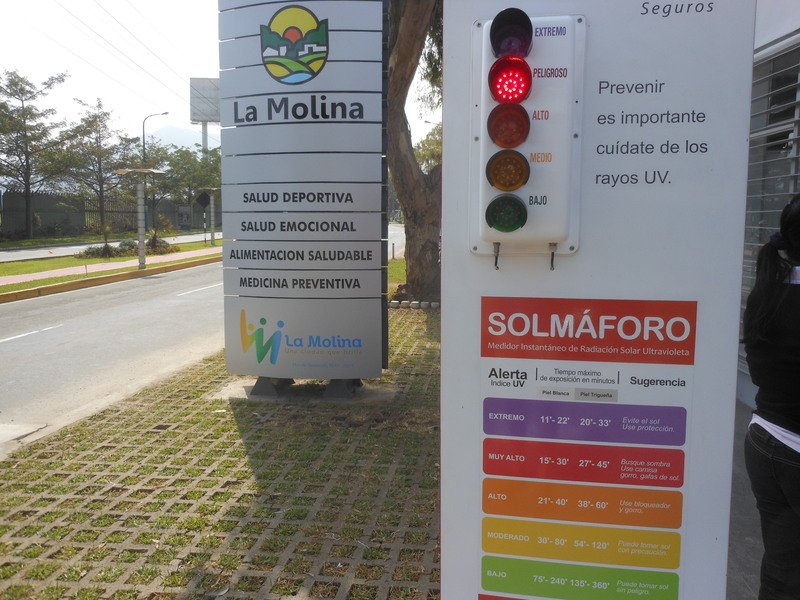 This clinic also includes a stoplight display to alert people to how much ultraviolet (UV) radiation is hitting their skin courtesy of the sun’s rays. 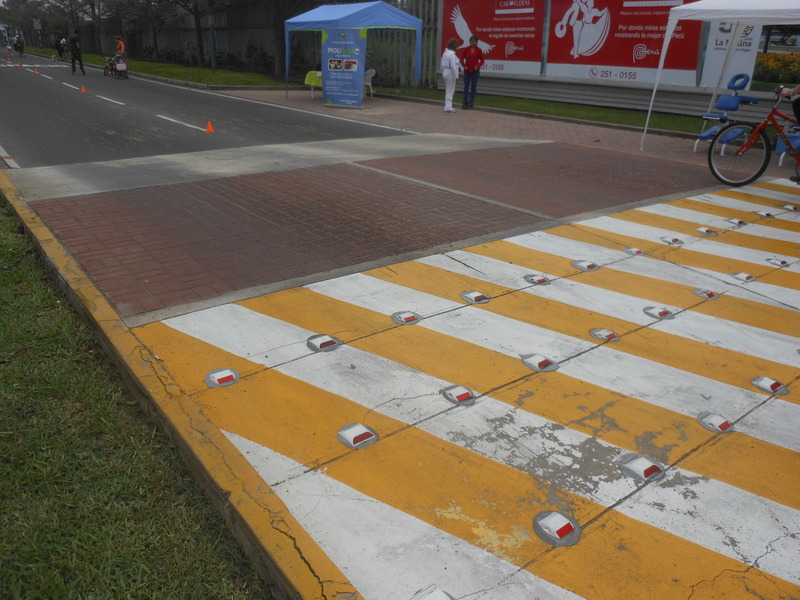 Along with the UV stoplight, another gesture of safety from the builders of the clinic was the installation of a large combination speed bump-crosswalk that allows people to cross the street safely to arrive at the clinic. This speed bump is so large that when cars approached it at full speed, the auto made its downward arc in such a way that the front of the bumper dug into the asphalt creating the ruts. 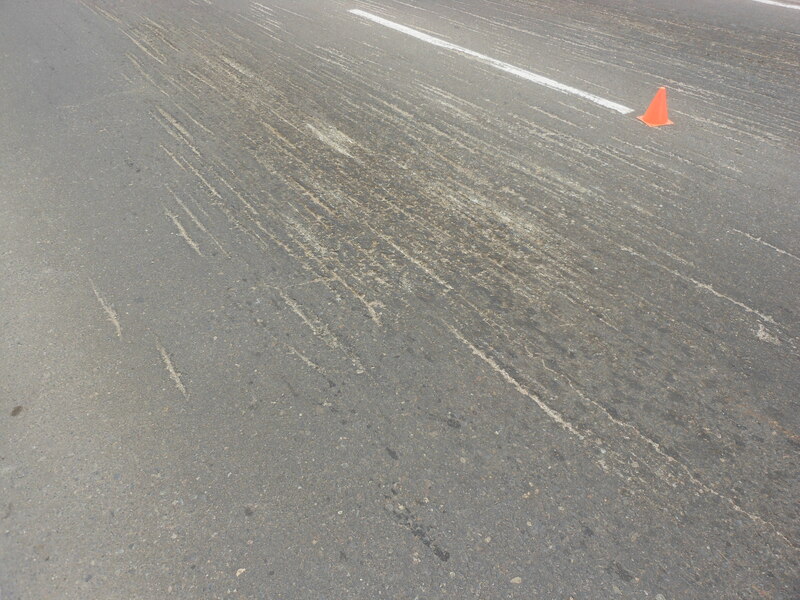 In addition, because the speed bump was built so quickly (in a shade over a week) and because no warning signs were installed, drivers did not initially know the artifact was there until their car was semi-airborne and leaving its mark in the asphalt. What was good for the health of the citizens turned out to be not so beneficial to the health of the street. Posted on June 21, 2012, in Peru, Photography and tagged asphalt, automobiles, cars, damage, Peru, photography, postaday, road. Bookmark the permalink. 7 Comments. Amazing! I’m betting people slow down now! This is Peru. You would lose that bet. Thanks. Did you notice that I took the “stoplight” photo while it was peligroso (dangerous) outside? The sunburn on the back of my neck the next day definitely noticed.